Bindi has been the nucleus of the Indian Beauty. Bindi is an integral part of an Indian woman’s beautification process for centuries and has evolved as an Indian woman’s pride and importance. What started out as a tiny little dot has gone through so many innovations that the world is no longer oblivious to what a bindi is and what importance it plays in beautifying a woman, and giving her the final touch of traditional and cultural finesse. As pretty and quaint as it looks, the word Bindi, or bindu’ is derived from a Sanskrit word, which means ‘a dot, drop or small particle.’ In Tamil, Malyalam and Telegu the bindi is referred to as ‘Pottu’, or ‘Bottu’. It is a piece of decoration used to adorn the forehead of a woman, and is a common accessory in South Asian countries, which include Pakistan, India, Nepal, Sri Lanka, Bangladesh and even Mauritius. Initially, the Bindi had religious connotations attached to it and was deeply embedded with values and traditions attached to Hinduism. It was believed that the centre of the forehead where the bindi was applied was the 6th chakra, or in other words the area of cloaked wisdom. The sole reason for applying the bindi was to generate this covered wisdom and to strengthen it even further. It was also considered a symbol for warding off the evil eye or bad luck. Today, the bindi has moved forward with the changing fashion trends and one can find a large assortment of these tiny dots that come in various colors and styles. Back in the historic times, the bindi was only worn by women who were married, but these days’ young girls or teenagers also wear bindi to team up with their traditional outfits like saris, salwar kurtas, or lehengas. Bindi was round-shaped, when originated several decades ago, with the passage of time and with people’s changing tastes, a large variety of bindis are now available to suit everyone’s need or style. Besides the simple round shaped bindis, one can also find bindis that come in several shapes of flowers, peacocks, snakes, and birds. To make the bindi look more fashionable, designers have implemented tiny stones, metal wires or have replaced the bindi with little pieces of jewelry as well. The majority of colors include shades of red, black, blue, yellow, green, pink, gray, and purple. In India particularly, there are several variations of the bindi depending on the region or state. For example, in Maharashtra the bindi is worn in the shape of a crescent or a curve with a tiny dot underneath. On the other hand, Rajasthani women wear a bindi shaped like a tear drop and is more elongated. 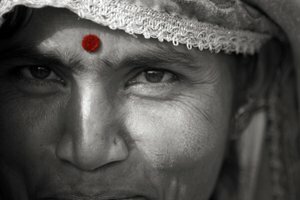 In addition to that, one cannot miss the Bengali style which is a large round red bindi. Anyone who visits India and loves Indian outfits cannot forget to put a bindi since that gives it the real ethnic touch. Bindis are extremely popular, especially with the younger generation across the world, who have an inclination towards Indian customs and traditions. Even popular Hollywood stars and singers including Selena Gomez, Julia Roberts and Madonna have been seen wearing bindis and flaunting this accessory with absolute ease and panache. Moreover, popular Indian actresses like Rekha, Hema Malini, Aishwarya Rai, and Bipasha Basu wear a bindi with their traditional outfits.